Tegucigalpa is the capital and largest city in Honduras and has roughly 900,000 inhabitants living in the city, 1,4 million in the total urban area. The city is located in the south central part of the country at an elevation of nearly 1,000 metres above sea level. It is the political, economic and cultural heart of the country, but compared to other sights and landmarks in the country, Tegucigalpa is not particularly interesting, nor attractive for travellers and some extra safety precautions are advised as well, especially after dawn. 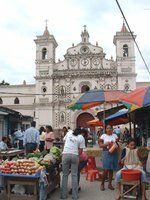 Both culturally as well as naturally though, there are many nearby villages and parks within short distance of the city, making day trips when basing yourself in Tegucigalpa possible. Parque La Leona is an old neighbourhood in the center of Tegus, overlooking the central park. It is a bit of a labyrinth to make your way up the old steep windy streets to arrive at parque La Leona, but it is a nice park, with a beautiful view, and a relaxed atmosphere. If walking, if you start facing the front door of the basilica in the central park, head to your left, and just keep walking up hill, and you will almost certainly hit the park as long as you continue upwards. Or ask someone in the area. In the park there is a little store/restaurant that sells typical Honduran food and has a patio overhanging from the park, with a spectacular view of the city, the valley, and the hills. Parque el Picacho is a park overlooking the city which takes its name from the huge statue of Jesus Christ, also called "Cristo el Picacho", which is visible from almost any point in the city. Free parking is available at the entrance of the park, and entrance to the park is a nominal fee (around 5 USD). The views from the park are gorgeous. The park is well maintained, clean, and seemingly not very busy (though likely busier on weekends). To get to the park if you don't have a car, you can take the rapidito bus that passes the park on the way to El Hatillo. The bus leaves from a few blocks north of the central park. If you walk to the end of the Calle Peotanal that begins in front of the basilica, and follow it to the end, through the black gates, past the Museo de Identidad Nacional, all the way to the Bonillo Theatre, take a left there on the far side of the theatre, walk up one block and the bus leaves on the right. Or just ask someone in this area. On the rapidito ask the fare-taker to tell you when to get off for Picacho (about a 5-10 minute walk in to the park gate, then a further 15 to the big Jesus). The bus ride takes around 15 to 20 minutes. Museum of National Identity - Calle El Telegrafo. Museum of Honduran history and art. Gets good reviews on other sites. National Zoo, on the same hill as the Picacho statue, with tropical animals such as monkeys, bright-colored parrots, and others. There is a separate entrance fee to enter the zoo. While not a horrible zoo, and worth seeing if you don't mind dropping a few dollars on the entrance fee, the zoo features mostly lethargic animals, the larger ones often noticeably insane as a result of their encagement. The zoo has a variety of monkeys, crocodiles, a jaguar, tapirs (anteaters), snakes, a collection of various raptors, and others. Tegucigalpa enjoys a pleasant tropical climate with warm and relatively humid weather but because of its elevation temperatures and humidity are more bearable than for example in the north. Temperatures average around 28 °C during the day and 18 °C at night. March to May is slightly warmer though. The dry season lasts from November until April, after which the rains start to fall, ending in October again. There are a number of bus international bus lines running to Tegus from other Central American capitals. These offer first class, very comfortable service at a reasonable price. A trip from Managua, San Salvador, or Guatemala City would cost between 20-40 USD. Ticabus, is the most affordable and frequented by backpackers. Hedman Alas, Nicabus, and King Quality, are other first class, reliable bus companies. Of course, it is also possible to travel on less comfortable, less expensive lines, but this is difficult or impossible to plan from afar. Internal travel in Honduras is easy enough, and made more easy thanks to the excellent transportation guide published by the Honduran tourism magazine called Honduras Tips, and available online at their website. Travel from La Ceiba, on the north coast, Empresa de Bus Cristina provides good service, at around 10 USD for the 7-8h trip. 95% of buses coming to Tegus arrive into Comayagüela, the sister city of Tegucigalpa. It is also reputedly one of the more dangerous parts of the city. If arriving to Comayagüela after dark, do not walk around looking for a place to stay. Even in the day, walking from bus stations in Comayagüela to a hotel or hostel any distance away would be a bit risky. There are common bus stops throughout the town, but are unlabeled. Find a large group of people standing on the sidewalks for the largest selection of bus routes. To know the main destinations of the buses, look on the front of the bus above the windshield. Most buses operate to distinct neighborhoods and link to El Centro or the market in Comayaguela. In the market in Comayaguela you can also find many inter-city buses with various prices and various levels of comfort, ranging from the most common chicken-bus to double decker luxury buses. Colectivos, like the city buses, run set routes from one point to another. If you see a long line of people weaving down a side walk, this is most likely a collectivo line. Tegucigalpa has a unhealthy variety of American food restaurants: McDonald's, Burger King, Wendy's, Subway, etc. All follow "home office" food preparation procedures and travelers can eat at them without fear of getting sick. The food court of Multiplaza will do for on-the-go meals. Tipping in Honduras is 10%. Tipping is not generally expected at smaller restaurants but always appreciated. La Cumbre, ☎ +504 2211 9000. The nicest restaurant in town (US$20/person or so) on top of the "mountain" of "El Hatillio." The food is awesome as is the spectacular view of the city. Get there about 5:00PM to enjoy the daytime, sunset and evening views of Tegus all in one sitting. La Milonga is an Argentinian restaurant in the part of town called La Palmira. It is a mid to up scale restaurant, where meals are L100-140 (US$5-8) per person. They have a good menu full of healthy and delicious food, of which the tomato soup is particularly recommended. They also have a reasonably priced wine menu featuring Argentinian imports, and delicious L40 licuados. La Terraza de Don Pepe a well known eating establishment just off the central park, which serves typical Honduran food at better quality and slightly higher prices than your everyday Honduran comedor. Good for travellers looking to sample the local food while taking little risk of tainted food. The location, on the second story, overlooking the street below (hence the name of the restaurant) is nice. The entrance however is very hidden, but there is a sign. It is on the street to the east side of the park, one or two blocks to the north. Duncan Maya is located just off the park, on the same street as La Terasa, but a bit closer to the park. It is on street level. Duncan Maya is often open later than other places in the area and at a certain hour will be your only alternative to fast food places. That being said, the food is greasy and a bit over-priced. But, they do sometimes have live bands at night (very loud), and it's a must for the "local" experience. Their "bistec de caballo" (yes, horse steak) is excellent. Casa Maria, Col Castaño Sur Ave Ramon E Cruz #202 (From Banco Ficensa on Blvd Morazan, go a block and a half down the hill. It will be on your left.). Some of the best food in the city, with a variety of international cuisine including French, Italian, and Nicaraguan. Prices are not too expensive with the average plate costing around US$15-$20. Staff and the owners are friendly and speak excellent English. They have a good selection of wines. Asados El Gordo has a few locations throughout the city and one on the road to Santa Lucía. Some of the best "parrilladas" or meat fests in the city accomponied by traditional sides such as beans, platanos, avocado, cheese, mantequilla (crema), and the oh so necessary tortilla. Very moderately priced: the "parrillada para dos" includes grilled chicken, chorizo, grilled steak, two plates of the sides mentioned above, and two drinks for just around US$20, and provides enough food leftover for another person to eat. Friday and Saturday nights after nine may get a tiny bit dangerous as the alcohol content in the patrons goes up. In Honduras, empty beer bottles are left on the tables until the bill is paid, so you can get a very quick visual indication of where cooler heads will prevail and where tempers may rise just by looking. Beers range in price from L12 to L30 depending on where you buy them. The cheapest way to go is to buy bottles from a store, however to do this, or at least to get the cheapest price, you need to have a supply of empties to exchange for new ones. You will have to pay more the first time to buy the bottles, but then you've got the cycle going. Decent rum is incredibly inexpensive in supermarkets (US$6/bottle for what would be $25 elsewhere). Honduras has four national beers, Salva Vida, Imperial, Port Royal, and Barena. They are all quite similar, all lagers. Port Royal is a bit skunkier, and Imperial may be a bit more flavorful. The local hootch, known as "guaro" presumably deriving from "aguardiente" (fire water), comes in two brands, Tatascan and Yuscaran. This is cheap, strong cane liquor, the choice selection of drunks in Honduras. At 40% alcohol, a litre of this stuff could run you as little as a dollar. Probably best to avoid, or a one time occasion. Several cheap hotels can be found 15 minutes east of the centre on Avenida Gutenberg. There are also many economical hotelitos and hospedajes (as well as some upmarket ones) around Inglesia Los Dolores, 5 calle. Granada 1. About US$13 per night for a single. Hotel Nankin Cost. About US$12 per night for a single. Hospedaje Cosmopolitan. About US$4 per night for a single. Real InterContinental Tegucipalga, Av. Roble, frente a Mall Multiplaza, ☎ +504 2902700, fax: +504 2312828. Check-in: 01232010, check-out: 01282010. The Real InterContinental Tegucipalga offers visitors to the capital 157 rooms, 7 suites, rooms and executive floors for guests who are the hotel for business. Also a restaurant, gym, pool, spa, among other services. Prices range between US$100 - $600 5 days. Tegucigalpa Marriott Hotel - 10 kilometres from Tocontin International Airport, the Tegucigalpa Marriott is in the new city centre, a short distance from the Multiplaza Mall. Has an executive lounge, meeting rooms, outdoor pool, fitness center and first-rated restaurants. Clarion Hotel Real Tegucigalpa, Col. Alameda Calle Principal, Juan Pablo II, ☎ +504 2202 4200, fax: +504 2202 4201. Clarion Hotel Real Tegucigalpa is located near the Cas Presidencial. In the vicinity of the hotel include cafes, bars and meeting rooms. It offers free shuttle service from the International Toncontín airport to hotel and vice versa. The 167 rooms for its guests by offering access to high speed Internet, fitness center and an outdoor pool surrounded by a spacious sundeck. Prices range between US$100 - $350. Hotel Paseo Miramontes (hotel.miramontes@amnettgu.com). 4 km. from the International Airport and in the vecinity of shopping malls, government offices, banks and the vibrant sector of the city, HPM provides personalized quality service at an excellent price. Hotel Capital, Ave.. Cervantes Calle Las Damas (3 blocks east of Central Park), ☎ +504 22200156. Check-out: 1300. Centrally Located in the historic district. Free Cable. Hot Water. $20. Aparthotel Paseo La Leona, 709 Paseo La Leona (2 blocks north of Central Park), ☎ +504 22370070. Check-out: 13h00. Free Cable and High Speed WiFi. Security. Parking. Extended Stay rates available. US$29. Palmira Hostel, Avenida Republica del Peru 4ta calle (adjacent to Benito Juarez park), ☎ +50499729666, e-mail: info@palmirahostel.com. Check-in: 10:00, check-out: 16:00. Hostel in the former Embassy of Ecuador, one block from the United Nations building. About US$10 per night for a dormitory and $30 for a private. We have a comprehensive list of accommodation in Tegucigalpa searchable right here on Travellerspoint. You can use our map to quickly compare budget, mid-range or top of the range accommodation in Tegucigalpa and areas nearby. This is version 14. Last edited at 8:23 on Aug 7, 18 by Utrecht. 15 articles link to this page.